The thousands of boys who passed through Don Bosco's school of St. Francis De Sales known in Turin as the ‘Oratory’, formed a motley mix: children salvaged from the city's mean streets, orphans, youth at risk, and sons of peasant families. Many of them often interacted with Don Bosco and sometimes with unexpected results. Among the last group was Francis Piccollo, a son of a poor farmer. Francis's arrival at the Oratory was uneventful enough. But a twist of circumstances surrounding his ‘theft' of bread would change his life. This is his story. In 1872 my parents enrolled me at Don Bosco's school in Turin. I was just eleven. I quickly learned that school life was a far cry from life on the farm. I was just beginning to settle into the daily routine when something happened that would eventually have long-reaching effects. Soon after my arrival, I began to look forward to the midday cry of "merenda" (snack time) that rang out right after classes were over. When "merenda" was shouted out, hundreds of boys would form an unruly line to receive their daily ration of a sweet-smelling, still-warm roll of bread. Two huge baskets of these savoury treats were delivered daily to the Oratory from a nearby bakery. One solitary bread roll it was assumed, would appease our hunger till dinnertime. Those who distributed the rolls would frequently cry out: "One each only! No more!" But it did not take me long to observe that some of my schoolmates were sneaking back into line and with an innocent look receive a second and even third helping. One day I succumbed to a steady rumbling from the pit of my stomach. A ravenous appetite in a growing boy is a grim reality and I was no exception. I wanted "more". If others did it, why couldn't I? With timorous trepidation I slipped back into line and received undetected a second and then a third bread roll. I rushed away and hid behind a pillar to devour my ill-gotten booty. What had I done! In my childish mind I was convinced that I had robbed from Don Bosco who had already become a warm friend to me. I quickly convinced myself that I could no longer go to Holy Communion after committing, what in my innocence I saw as a heinous crime. I made an immediate resolve. Yes, I would go to confession and promise never to steal again. But then how could I? I always went to Don Bosco for my confession, and there was no way I would reveal to him what I had done. Then I remembered that at the shrine of Our Lady of Consolation (Church of the Consolata), just a stone's throw down the road, confessions were heard daily from dawn to dusk. So in the approaching darkness I slinked out of the Oratory gate and stealthily made my way to the shrine. By now the church was enveloped in deepening shadows. I joined a small knot of penitents waiting to go to confession. When it was my turn I could only see the shadowy figure of the priest. In my boyhood simplicity I began: 'I always go to Don Bosco for confession, but I've come here because I don't want him to know about the terrible thing I've done." "Don't worry, child. I promise he'll never find out." It was Don Bosco's voice! I was stunned into silence. Only later did I learn that he was frequently invited to hear confessions at the shrine. "Don't be afraid," the unmistakable voice said. "Tell me what is troubling you". I was shaking like a leaf. " I...I stole two rolls of bread from him," I stammered." "Child, hunger and thirst are two wonderful gifts that God has blessed us with. So good food and fresh water is His way of helping us enjoy our hunger and thirst." I was too taken aback to reply. "So from now on, whenever you feel hungry, I want 'you to come to Don Bosco and tell him. He will see that you get all the bread rolls you can eat." Then to my horror he called me by name. "Francis, I want you to trust Don Bosco always and go to him whenever anything troubles you. Not having anyone to trust with your problems can make your life very miserable. You can always depend on Don Bosco for help because he is very rich. No, not with money. His riches are made up of all the trust that his boys give him." The trust that Don Bosco had asked of me that memorable evening was put to the test a year later. One day I was told that someone was waiting for me in the school's visiting room. There I found my mother on the verge of tears. She had been notified by the school secretary that payment for my schooling at the Oratory were long overdue, and unless my overdue fees were paid, I would have to withdraw from school. Just then we were interrupted by the school bell. I told mother to wait for me and I would return as soon as school was let out. I then dashed off to my class. On my return I saw that her tears had vanished. In fact I was surprised to see her beaming with joy. She had just spoken with Don Bosco she said, and he had assured her that she need not worry about my dismissal. In fact, he had jokingly remarked that if I should be escorted out of the Oratory by the main gate, he would make sure that the back door would be open for me to return. I was greatly relieved. But my relief was short lived. Just before dinner I received a message from the Father Treasurer that I was to report to him. I feared for the worst and went straight to Don Bosco's room and knocked. "Who is it?" a voice asked. "It's me, Francis Piccollo." He opened the door and greeted me with that engaging smile he always wore. Somehow I could tell that he knew why I had come. He went to his desk, picked up a slip of paper and asked: "How many months are your school bills overdue?" I told him. Before I could say another word, he wrote my name on the slip of paper. Then below: "All school expenses for Francis Piccollo paid in full for this school year. (Signed) Don Bosco." "Here," he said with a disarming smile, "Bring this to Father Treasurer." With a stroke of the pen he had wiped out my entire year's debts. But what affected me most was the gracious tact he used to spare me any embarrassment he knew I must have felt about my unpaid bills. It was then that I remembered what he had told me about entrusting him with my problems. And that he would make all things right for me if I put my trust in him. As my education at the Oratory was drawing to a close, I made a decision that would change the course of my life. When I made up my mind to reveal it to him, I went out to search for him and found him in the school play yard surrounded as usual by a group of boys, regaling them with an amusing story. As I drew near, he noticed the anxious look on my face and called me over. But I hesitated. So he left his merry company and walked towards me. "You have something to tell me, Francis?" "Yes," I said. "But I don't want the others to hear." We withdrew a few steps away. In a hushed whisper I said, "I want to give you something - a gift." "A gift? What kind of gift?" "Me!" I blurted out. "I'm the gift." I could see he understood what I was getting at, and his face became wreathed in a smile that he always wore when he was very pleased with something. "Francis," he said, "I could not ask for a more beautiful gift than the one you have just given me." Francis' gift was the call to follow his vocation to join Don Bosco's fledgling religious Salesian Society. He professed at the age of 16 and rose rapidly through the ranks: novice, priest, director, and provincial. 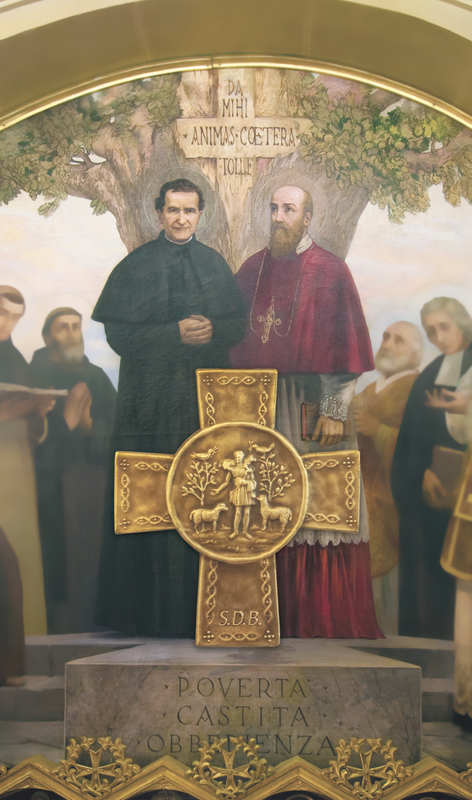 Most of his Salesian life was spent in Sicily During his tenure as provincial he opened numerous schools, which flourished in a remarkable manner. Father Francis Piccollo died in 1930. But not before attending the beatification in 1929 of the priest whose bread he had "stolen," and who had in return stolen his heart.